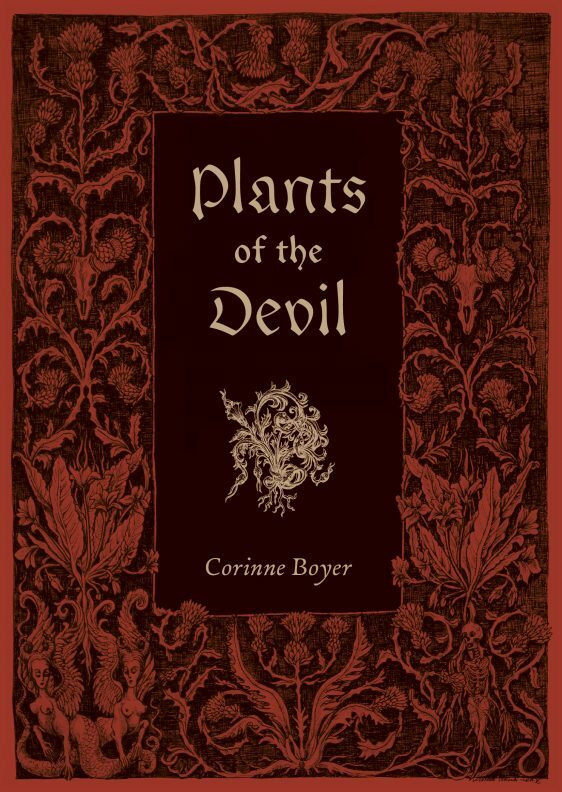 With Daniel Schulke’s recent Thirteen Pathways of Occult Herbalism and his forthcoming Arcana Viridia: the Green Mysteries, Three Hands Press seems to have something of a botanical focus of late, and Corinne Boyer adds to that with her Plants of the Devil. Having previously released Under the Witching Tree: A Folk Grimoire of Tree Lore and Practicum through Troy Books, it’s pretty clear where Boyer’s interests lie, and this makes a good fit with the current emphasis of Three Hands Press. Rather than treading a familiar path through a witch’s garden with all its usual botanical suspects, Boyer’s focus is specifically on the garden of the devil, that is, plants that in folklore have an association with the devil, whether they be connected directly with witchcraft and maleficia, or not. This can sometimes be a minor connection, with one, perhaps little known, folk name having a diabolical variant, amongst many others. Inevitably, this can feel a little circumstantial, but Boyer sees a profundity in these names, assuring us that even if this connection seems trivial, it isn’t for students of the deeper mystery. As a trade paperback of some 160 pages, Plants of the Devil is a relatively slim volume. 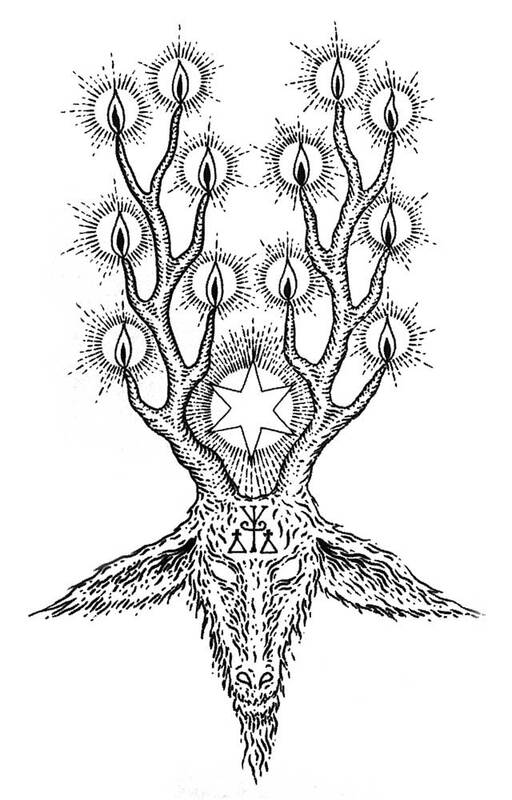 It is divided into chapters that categorise the devil’s plants into broad areas of focus: painful or poisonous plants that bear his name, plants that were ill-omened or unlucky, plants that were used against him, and plants that were used to invoke him. Boyer writes effortlessly, with a capable tone that is free of too much in the way of convoluted occult writing; albeit occasionally a little too generous with the commas – rich, indeed, for me to say, yes. The content of Plants of the Devil is quite encyclopaedic in nature, in that the consideration of each plant provides something of an info dump, harvested from a variety of sources. These sources, all correctly and meticulously cited, are often encyclopaedias and guides in themselves, and what this means is that the gems of information they provide are often without much in the way of context; a context which may well have been lacking in their original entry too. It is a minor quibble, but what this means is that there is no way to tell the value of a particular belief about a plant, or a quality attributed to it. One poorly remembered and potentially misrecorded anecdote, or all out lie, from a singular source long dead, could be sitting alongside a genuine and widely held belief. There’s probably no way to remedy this unintended equivalency, and it is just something that one finds oneself noticing as one goes through the book. 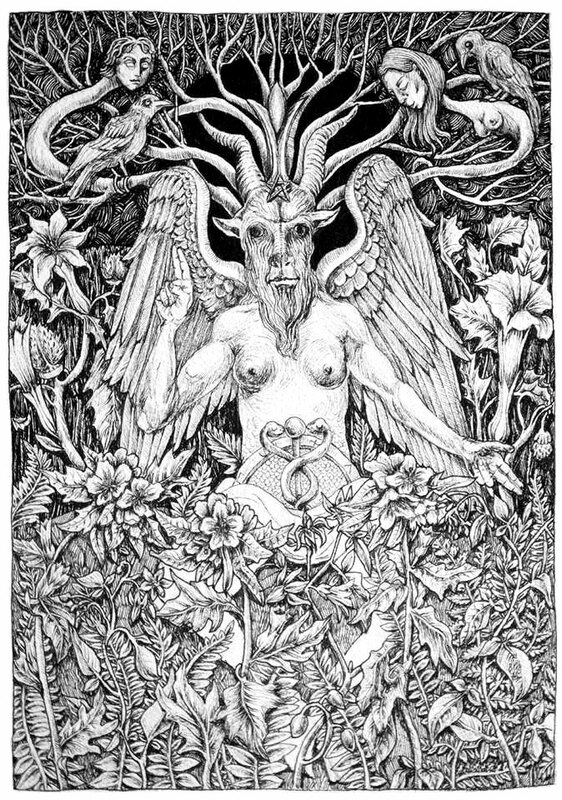 Illustrations in Plants of the Devil are provided by Marzena Ablewska, whose work can be simply described as voluptuous. 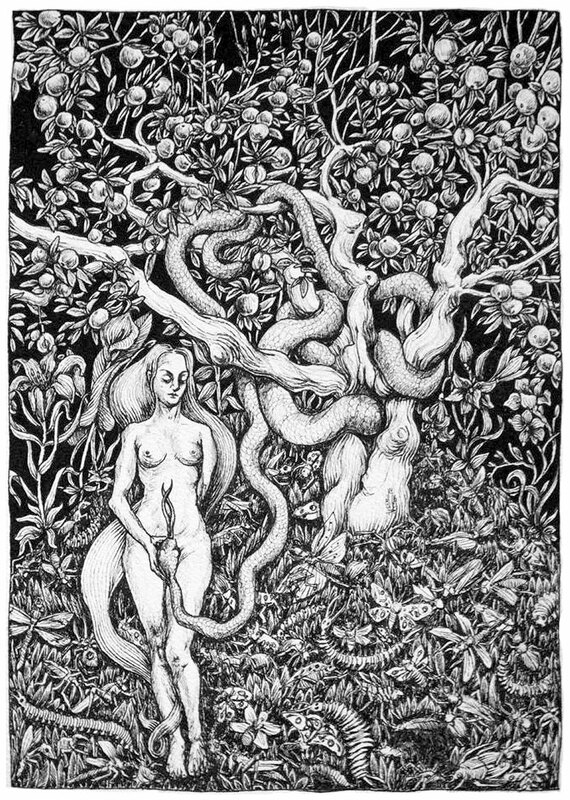 These, for the most part, take the form of full page, pen and ink illustrations that are densely populated with a surfeit of both plant, human and reptilian forms; all delightfully sensuous and corporeal in their intertwining tableaus. Her work, so redolent of Hans Baldung, makes for a power evocation of the spirit of witchcraft and the transgressive feminine; and a fitting compliment to Boyer’s words. Due to its unique focus, Plants of the Devil, makes for a satisfying meditation on diabolus est hortus, with both the relative brevity of the work, and Ablewska’s illustrations, helping to tighten the lens still further. It is beautifully presented, with a competent layout style that has a hint of the archaic about it without telegraphing it too much or being overbearing. Plants of the Devil is available in a variety of formats, the most humble of which is a trade paperback version with colour cover, as humbly reviewed here, and available from sellers such as Amazon. More exciting are the limited standard hardcover with colour dust jacket of 1000 copies, a deluxe edition in quarter red pigskin and slipcase, limited to 41 hand-numbered copies, and a super special edition in full red pigskin and slipcase, limited to 17 hand-numbered copies. I must admit to being unaware of Fiddler’s Green before receiving copies from publisher Clint Marsh, but one look at these two issues and it was a “where have you been all my life” type thing. 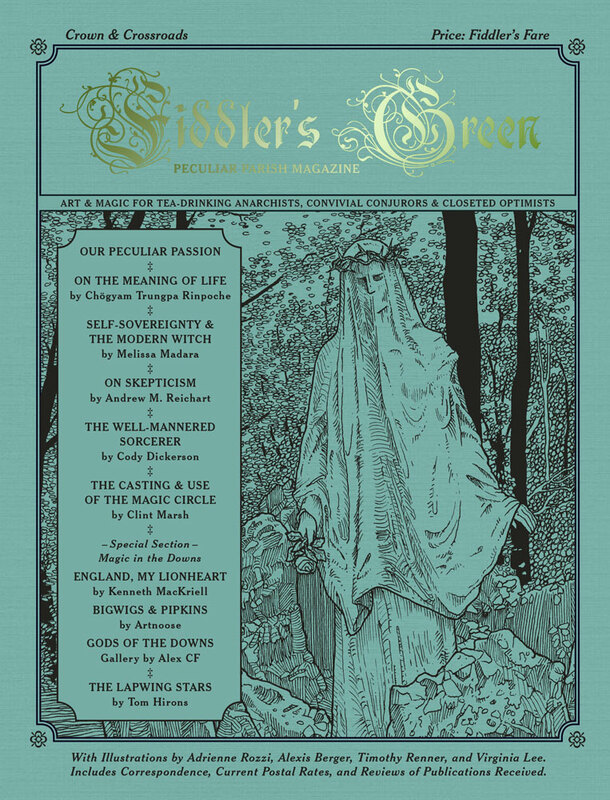 Fiddler’s Green is described as “art and magic for tea-drinking anarchists, convivial conjurors and closeted optimists,” an appealing cadre to be a part of, even if my tea-drinking is minimal at best. This brief is perfectly reflected in the style, illustration and formatting, with a look that is evocative of something one could imagine sitting alongside Jimmy Cauty’s Lord of the Rings poster, or the work of Hapshash and the Coloured Coat; indebted as it is, like them, to the stylings of Art Nouveau and the pen and ink drawings of Arthur Rackham. 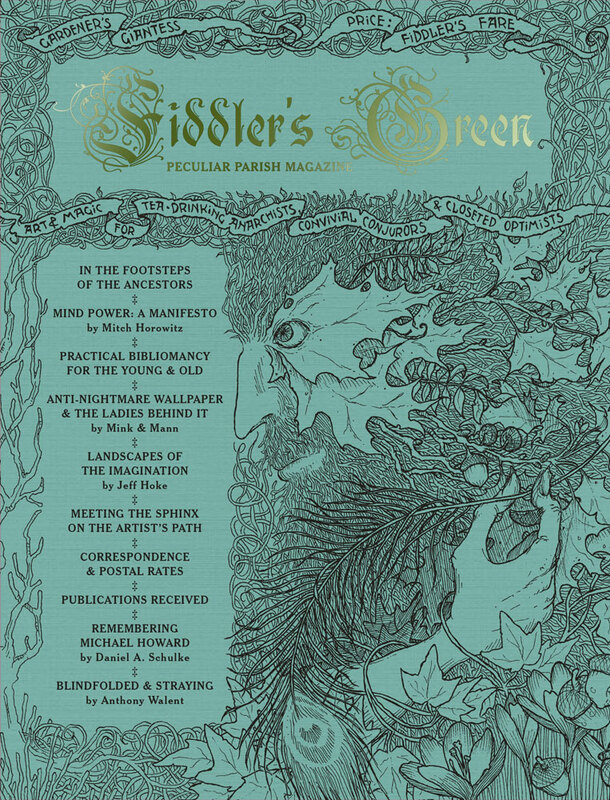 If there’s one word to describe Fiddler’s Green, it’s ‘delightful.’ The small press feel, the whiff of a village newsletter, the smack of leather on willow… you get the idea. Each of the issues is a saddle-stitched, stapled magazine of 35-45 letter-sized pages, bound in a muted green coloured card, with everything rendered in black and white, save for the foiled title on the cover. Editor Clint Marsh presumably provides much of the written content here, with a handful of the contributions being uncredited. These are often reflective musings based around little themes: bibliophilia, artistic process, creative thinking – all things one could enthusiastically support and subscribe to the newsletter thereof. In addition to these credited and uncredited contributions, and alongside writings from authors unknown at least to me, there are a couple of familiar faces. Timothy Renner of Stone Breath provides illustrations to a piece by Kenneth MacKriell in the fourth issue, while Daniel Schulke contributes a eulogy to Michael Howard in number 3. Indeed, Schulke and Three Hands Press never seems that far away, with the imprint, amongst others, punctuating the volumes with adverts. The formatting also has a similar aesthetic to many of Three Hands Press titles, with that beloved combination of woodcuts and archaic typefaces. There’s no persistent theme to Fiddler’s Green, other than a fulfilment of the broad and charming mission statement. There are elements of witchcraft and folk magic, but by no means in an all-pervasive manner. There’s a certain reflective and philosophical attitude, but again this doesn’t dominate. And there’s a palpable sense of spirit of place and landscape. In all, it perhaps lives up to that othertimely aura that permeates from cover to cover, redolent of Victorian and fin de siècle journals, fitting written companions for salon and parlour. Each issue concludes with a couple of regular features: letters to the editor (usually pretty unanimous praise for previous issues) and a review section. In the third issue, the reviews are something of a revelation, focusing predominantly on zines and other small press outputs, an area I feel woefully unaware of. In the fourth, it is books attract the reviewer’s attention with a certain degree of crossover with the content and themes found here at Scriptus Recensera. 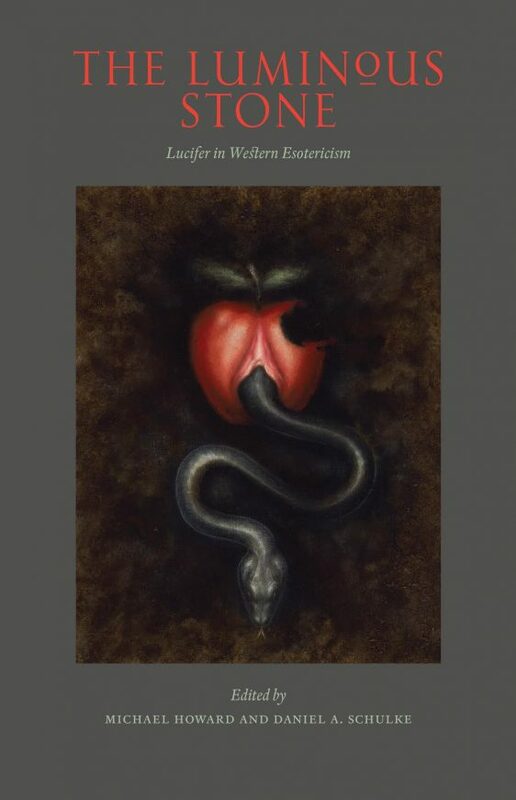 This compendium of essays on the role of Lucifer in Western Esotericism represents the last significant contribution to occult publishing by Michael Howard before his passing in 2016. In addition to his role as co-editor, he provides an essay and is joined by Frater U.:.D. :., Robert Fitzgerald, Ethan Doyle White, Fredrik Eytzinger, Richard Gavin, Raven Grimassi, Lee Morgan, and Madeline Ledespencer. The Luminous Stone is the third entry in Three Hands Press’ Western Esotericism in Context series, following on from previous explorations of Babalon and Traditional Witchcraft. As with any compendium such as this, the most interesting contributions are ones that explore territory less travelled. Any consideration of the usual biblical or folkloric accounts, and the intersection thereof, are going to be pretty uninspiring, without much, if anything, new to offer. Mercifully, there are instead several explorations of completely alien territory. Such territories are ones in which the Luciferian spirit of inventiveness seems to have been fully embraced by its adherents, with each providing something of an idiosyncratic interpretation. The occult scene of 19th century Paris as described by Madeline Ledespencer is a prime example of this, with Ledespencer showcasing two figures, L’Abbé Boullan and Maria de Naglowska, each with a Luciferian supra or subtext, but each with a unique take on it. After a less than stellar start from this volume’s first two contributors (English as a second language for one, and just a bit stilted for the other), Ledespencer’s piece is refreshingly well written, with an ebullient style that reads easily and conveys a sense of both the love and knowledge she has for her subject matter. As one would expect from a Three Hands Press book, there’s the occasional nod to the Cultus Sabbati and the work of Andrew Chumbley. 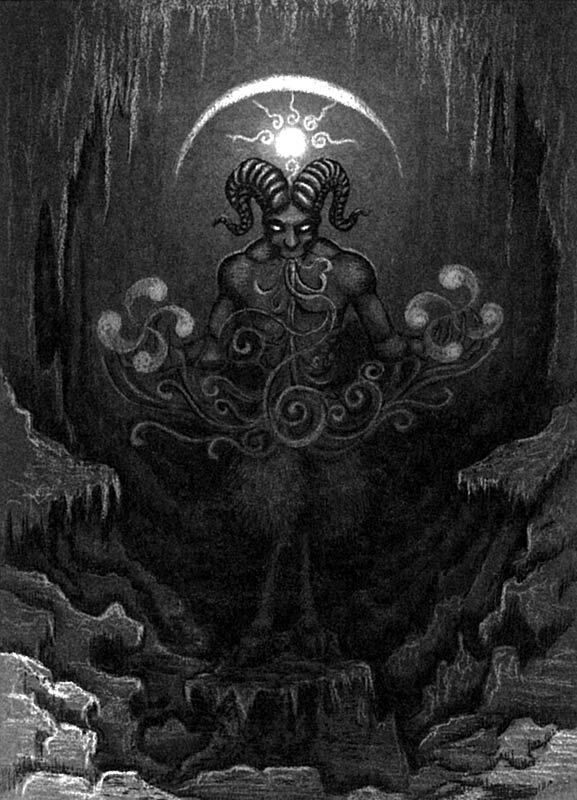 Robert Fitzgerald’s The Hidden Stone: Devotion, Lucifer and the High Sabbat uses the Cultus as an example of a modern witchcraft sodality with a particularly Luciferian anatomy, focussing, by way of example, on Chumbley’s rite A Lover’s Call to the Angel of Witchblood. Fitzgerald steps through the rite line by line in order to untangle its cosmology, making a little more sense of Chumbley’ picturesque prose. In a similar area, Ethan Doyle White considers the role of Lucifer in broader contemporary pagan witchcraft, tracing the tantalising mentions from the original witch trial records into the modern era and the various works of Doreen Valiente, Robert Cochrane, and the Farrars et al. In Teachings of the Light, Michael Howard returns to material covered in his Book of Fallen Angels, a work that seems a significant touchstone for many of the authors included here. He describes his encounters with Madeline Montalban, and gives an overview of the system of Luciferian magic from her Order of the Morning Star. This provides a little more depth than his previous discussions of her system, placing it within the context of the occult milieu in which she existed and noting the connections, for example, with the Atlantean mythos of Dion Fortune and Gareth Knight. A less recently seen but welcomed faceless face is Frater U.:.D. :., whose piece, the gloriously titled ‘Non Seviam’ as Ontological Paradigm, oh yes, begins dryly enough, discussing Lucifer’s antinomian qualities, before briefly taking a more interesting turn and considering him in relation to the Fraternitas Saturni; of which the frater has been a member for over thirty years. It is an instance like this, where an insight is provided into an organisation’s particular understanding of Lucifer, that provide some of the most satisfying content in this book; as is the case with the essays considering the Cultus Sabbati, or Madeline Montalban’s Order of the Morning Star. The consistently disappointing Raven Grimassi keeps the disappointment consistent with Lucifer in the Lore of Old Italy, a clumsily written piece, full of sentence fragments, redundancies, spelling mistakes and non sequiturs, always meandering without any clear direction. As highlighted in a previous review, Grimassi’s grasp of history seems casual at best. In one case he refers to the “Middle Ages and Renaissance periods” (as if they were synonymous), but then uses an event from the 17th century as an example of his claim. Another contribution also somewhat disappointing in its lack of thorough proofing is The Latent Radiance, which opens this anthology: a single sentence runs breathlessly to seven lines, there are prochronistic references to inhabitants of Canaan between 1200 and 1000 BCE as ‘Jews,’ rather than the more accurate ‘Israelites,’ and everyone is hyperbolised as ‘renowned.’ It does use the word ‘sodality’ though, which seems to be the new ‘praxis,’ given its popularity in this volume (poor ‘praxis’ only gets a single look in). The Luminous Stone features cover art by Francisco Divine Mania (with the rather gloriously Symbolist and Decadent-styled Garden), while the interior is punctuated occasionally with the black and white silhouetted images of Hagen von Tulien. It’s not always clear if von Tulien’s images relate to the essays that precede or proceed them, but they are as striking as ever. I’m particularly partial to the one that looks like an airline safety card, in which the hazard appears to be a sorcerous attack; the only option seems to be to panic. Overall, The Luminous Stone is an enjoyable volume, if a little underwhelming. Its 150 pages fly by, and while there are some very good contributions, there’s less of a sense of this being as essential a read as, say, Hands of Apostasy was. There’s a few glaring spelling and formatting errors that are somewhat unexpected due to the usually high standards of Three Hands Press. Raven Grimassi’s piece is particularly prone to this, referring to ‘Gain Mysteries’ when surely ‘Grain’ is intended, and having St. Jerome miraculously turn into St. James between paragraphs. He’s not alone though, and in another essay, an explanatory note is incorporated, italic styling and all, into the Robbie Burns poem it is commenting upon. The best of these errata, due to its surreal qualities, is in Lee Morgan’s piece The Lucifer Moment, where he notes that the ubiquitous image of the Luciferic anti-hero means we are ready to see Lucifer in a new way “very shorty” …which certainly would be a startling new look for the Light Bearer; and indeed, one could argue that an encounter with a diminutive fallen angel would create that paradigm-shifting moment of Morgan’s title. The Luminous Stone is available in a total run of 3049 copies: 2000 as a trade paperback, as well as a hardcover edition of 1000 copies bound in green cloth with colour dust jackets, and a deluxe edition of 49 copies quarter-bound in goat leather with hand-marbled endpapers. The paperback version, conveniently available via Amazon, features a stiff, weighty card for the cover and reverse, making for a tight binding that requires a little more effort than usual to keep the book open. 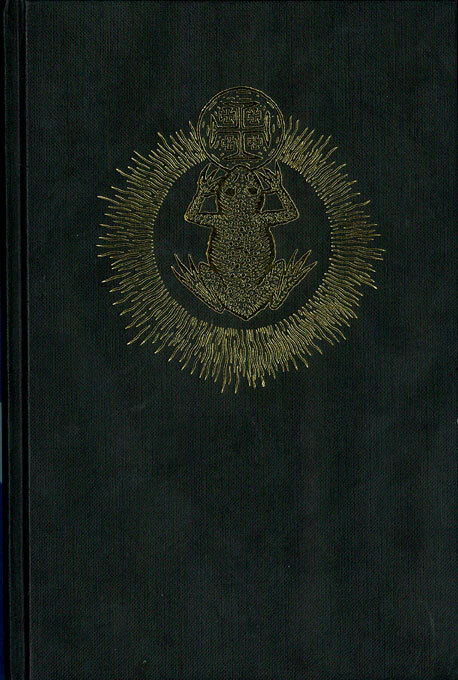 Contrary to what one might expect from the title and the talismanic cover of this book, this volume is not an exploration of the toad rite, or all that much to do with toads at all. Instead, the title marks this out as something of an annotated grimoire, a West Country Black Pullet as it were, collecting magic and charms from that area of England. While much of Gemma Gary’s work presents a system of witchcraft that speaks to a living, breathing, tradition, this is work is more of a documentary, free of much comment or integration into a broader system. One of the specific focuses of this book is what is referred to as dual faith observance, the way in which the practices of witchcraft and magic were not always, or at all, pagan, and instead were contextualised within the prevailing Judaeo-Christian paradigm of the time. Michael Howard makes mention of this in his introduction, and Gary does likewise in hers. What this means on a practical level is that many of the longer charms included in this work incorporate biblical psalms which might sit somewhat incongruously for people more familiar, and comfortable, with the idea of witchcraft as entirely a continuation or revival of ancient pagan religion. The Black Toad is divided into three main sections, each dedicated to a different Old Mother: Red-Cap, Green-Cap and Black Cap. The first of these, Old Mother Red-Cap, is a compendium of charms and spells. These spells address relatively common concerns of folk magic, protection and the healing of physical ailments, with a preponderance of methods for dealing with warts, perhaps not quite the scourge now that it evidently once used to be. The charms in the second half of this section incorporate magic squares into their formulae, including familiar ones such as MILON and NASI, suggesting some passing knowledge of The Book of Abramelin or similar texts, while the words of the famous SATOR square are expanded into a longer invocation used to attain anything you desire. All of these charms and spells are presented without comment, and without any referencing or specific provenance, so it is unclear as to whether they come from a single written source, what time they date from, or how widely they were used. Old Mother Green-Cap, as its name suggests, focuses on matters botanical, beginning with a brief survey of various plants and their magical and medicinal properties; though principally the latter. These are followed by sections on various ways in which specific plants can be used: as infusions of virtue, as protective plant charms, as plant charms for love, for animals, and in a general curative capacity. Here, naturally, if Old Mother Red-Cap’s methods of dealing with those troublesome and persistent warts proved less than efficacious, there are plant-based options available to you using Groundsel or Gooseberry. 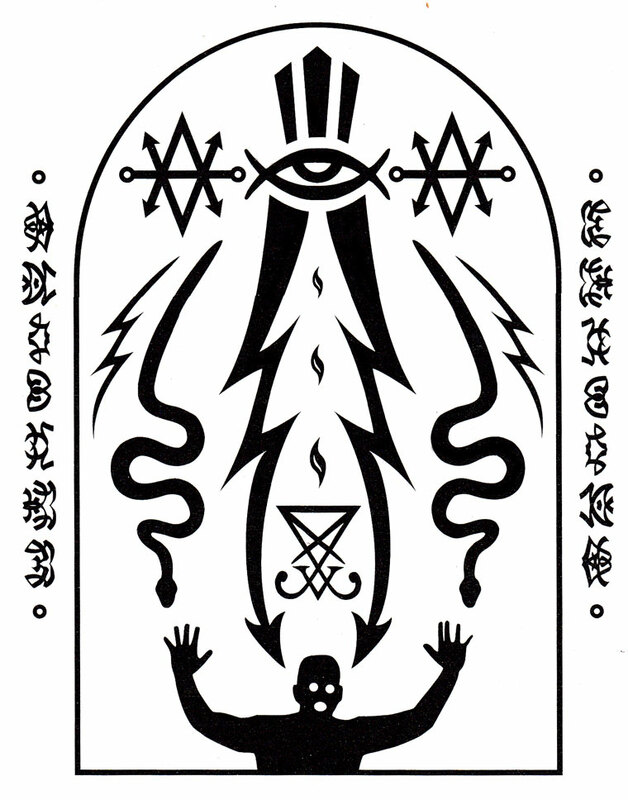 In the final mother, she of the Black-Cap, the focus turns to maleficia, with Gary prefacing the section by referring to the Double Ways practitioners of Cornish and West Country witchcraft, in which one’s status as black or white is entirely dependent on what the client expects of you. This section is, thus, comprised of various spells and formula of opposition and attack. There are spells with a focus on sympathetic magic, using footprints as the focus of attack and control, and the intriguing method called the Ill-Wishing Bag. 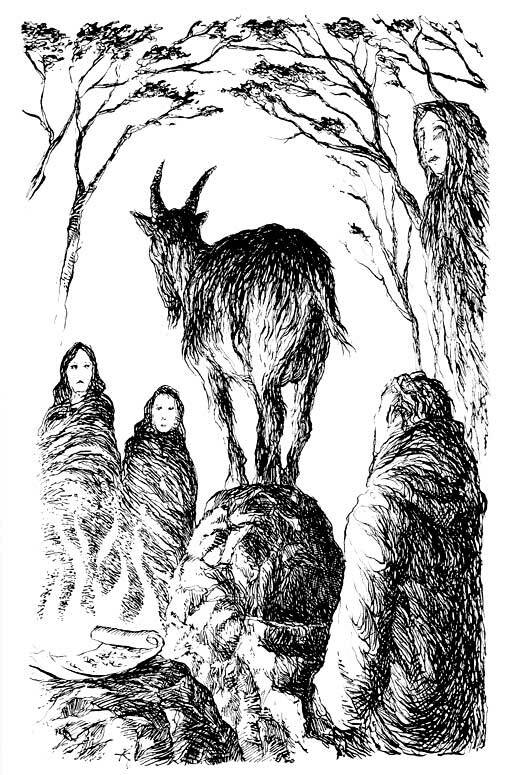 Old Mother Black-Cap also provides an opportunity to turn to the more darkly-dyed side of the Double Ways, with a discussion of the role in West Country witchcraft of the Old One of Many Names: the Bucca Dhu, Old Nick, the Black God, the Devil. 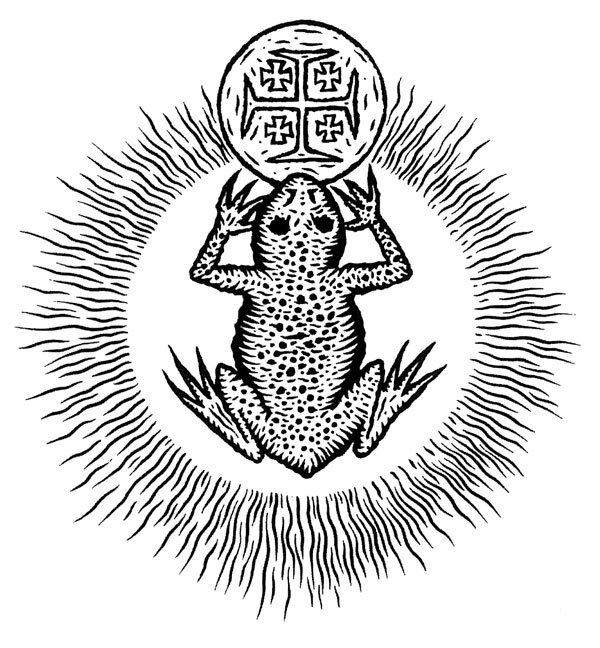 With this is also a brief consideration of the black toad of the book’s title, which is described as having the most inextricable and symbiotic relationship with West Country witchcraft of all the theriomorphous entities of witchlore. Gary makes a distinction between the West Country toad witch and the perhaps more familiar toad doctors, who would cruelly use batrachian body parts in their charms, as well as the equally-lethal initiatory use of the toad in East Anglian practices. Instead the relationship, which appears to act as an overall philosophy for West Country witchcraft, is a symbiotic one, better represented in the image of witch and beloved familiar. As a whole, The Black Toad is devoid of much in the way of an editorial voice, indeed it lacks much of a distinctive voice at all, seeming to shift tone, manner and vocabulary at times, as if some of the spells have been taken verbatim from their source. Information is presented in a brief, matter of fact manner, and it is only in the final Black-Cap section that a more expansive tone makes a welcomed appearance, allowing for elaboration and analysis. It is here, in the discussion of the Old One with its accompanying paean to toads, that one gets a sense of Gary’s true voice, with the emergence of her writing style that is always a joy to read. As with all of Gary’s books, The Black Toad is copiously illustrated in her trademark style of line and stipple. These range from beautifully rendered little page fillers, with a surfeit of skulls and other magical accoutrements, to full page, chapter-prefacing illustrations. As ever, these are beautifully rendered and make the perfect visual accompaniment to Gary’s subject matter: suggesting elements both archaic and hands-on, but with an unmistakeably modern touch. In addition to these, there are several pages of photographic plates by Jane Cox, documenting, for the most part, various magical objects, predominantly from the author’s personal collection or the Boscastle Museum of Witchcraft. In my mind, I always find this book from Scarlet Imprint occupying the same mental space as Hands of Apostasy from Three Hands Press. Both are compendiums of essays on various witchcraft topics, with a focus on what is referred to as traditional witchcraft. And both take themselves pretty seriously. One comes to expect much of a muchness when encountering collections such as these, with the usual range of suspects and the usual familiar topics. Like Hands of Apostasy, though, Serpent Songs delivers in regard to both the diversity of matters considered, and the breadth of contributors. While there are some familiar, and by no means unwelcome, faces, there are also writers that may not have had much published before, if at all. That doesn’t mean that the writing is sub-par, in fact, the very opposite. Edited by Peter Grey and sub-edited by Troy Chambers, Serpent Songs hangs together cohesively, despite the disparate contributors. There’s a rigour to the text, evidence of the dedication that Scarlet Imprint pour into their publications, with no sign of those common occult writing pitfalls: poor spelling, poor grammar and poor sentence construction; all of which have been, one assumes, expunged by the very welcomed red pens of Grey and Chambers. This exploration of witchy paths less travelled results in a broad itinerary that, in addition to sojourns in the usual locales, includes stops in Sweden, the Balkans, and the Basque region. There are actually two contributions that deal with Basque witchcraft, and welcomed contributions they are too, as it remains an area for which precious little of worth has been written. 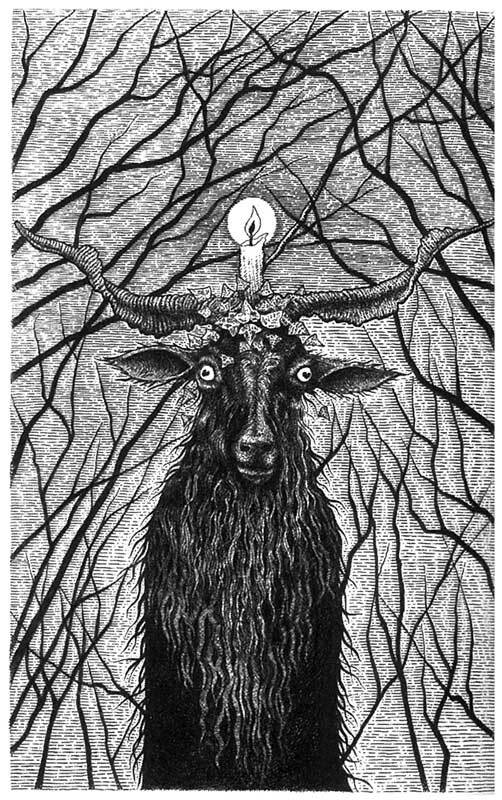 In Lezekoak, Arkaitz Urbeltz provides what is effectively a primer on Basque witchcraft, introducing the goddess Mari, her lover and son, Akerbeltz the Black Goat of the Sabbath, and the adversarial figure of Etsai. The second contributions, But the House of my Father will Stand, comes from Xabier Bakaikoa Urbeltz, who, like Arkaitz Urbeltz, is described as “a sorgin from one of the few remaining houses of Traditional Craft in Euskalerria;” it’s a small world. Urbeltz the Second’s piece, as its subtitles informs us, explores the concept of etxe or house in Basque witchcraft, both as a metaphorical concept and a tangible symbol of Basque culture. The etxe becomes a living entity, something of an alchemical egregore, comprised of the physical house (etxe, salt), the property (etxeondo, sulphur) and the inhabitants (etxekoak, mercury). Elsewhere on this trotting of witchy globes, Johannes Gårdbäck of Sweden gives a hands-on, introduction to Trolldom. He uses an anecdote of a consultation with a couple troubled by a spirit as a device with which to explain his techniques, and give a solid understanding of the paradigm and terminology with which he works. Gårdbäck’s approach is refreshingly pragmatic, with little sense of pretence or occult smoke and mirrors; unless lack of pretence is one of those smoky mirrors… we’re through the looking glass here, people. Some of the more familiar names here deliver to their usual high standard, with the trifecta of Gemma Gary, Shani Oates and Sarah Anne Lawless doing what they do best. 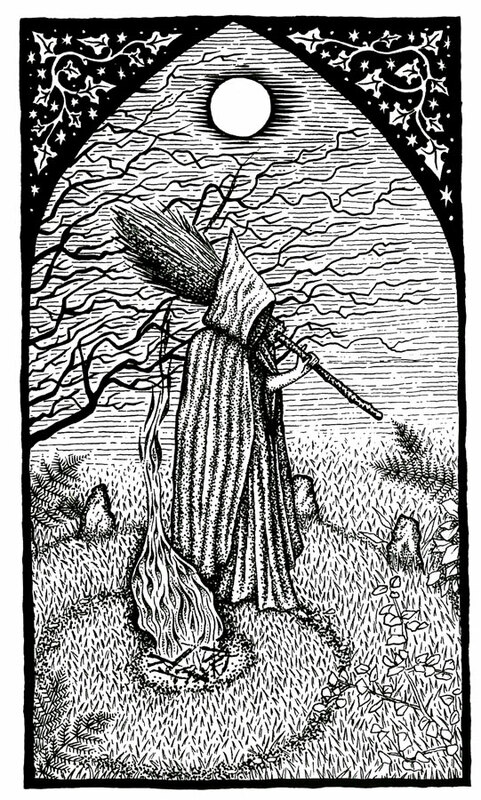 Gary’s essay and brief ritual, The Witch’s Cross, doesn’t necessarily cover much new ground, being a meditation on some familiar tropes of witchcraft and the lure of sites of liminality, but it’s done with such a beautifully rendered, poetic narrative that you don’t mind. The same is somewhat true for Lawless who in Mysteries of Beast, Blood and Bone, covers exactly that. It’s something of a familiar area for the ever sanguineous Lawless but her writing is always a joy to read and fair reeks of her subject matter, such is the unpretentious delight she obviously takes in it. And Oates writes, true to form, in her part stream of consciousness, part exegesis, part what the hel is this about manner, where you just buckle yourself in and see where it goes. It is, if nothing else, an intelligible journey, so you forgive a little disorientation here and there. Elsewhere, Stuart Inman and Janes Sparkes take the reader across the Atlantic for a look at the 1734 Tradition, an always interesting diversion in what is quite an exhaustive piece, documenting influences and confluences, mythos and ways of working. Steve Patterson goes matters Cornish with an exhaustive consideration of the Bucca, while Richard Parkinson considers the intersection between exorcism and the cunning arts in post-reformation England, where the lack of Catholic clergy left a hole in the market and job opportunity for versatile former exorcists. For once in matters of witchcraft traditional, the Andrew Chumbley vault has nothing to directly offer posthumously, but he does make an appearance via Anne Morris’ But to Assist the Soul’s Interior Revolution, an analysis of Chumbley’s art as representative of the idea that art born of magical practice expresses secret iconography. As with Jimmy Elwing’s piece in Hands of Apostasy, it’s always interesting to read takes on Chumbley, sometimes more so than reading Chumbley’s arcane prose itself, and this is the case here, with Morris taking a rather academic approach to frame and understand his artwork. With sixteen contributions, one could reasonably wager there’s something for everyone here. Not all of it is gold, some a tarnished silver or shameful bronze, but this is largely a matter of personal taste, rather than anything inherently wrong with the quality of the writing or the ideas put forward. The cultural diversity provides interest, preventing that feeling of wallowing forever in issues of Folklore, and listening to the Incredible String Band, in Bocastle; fun though that may be. 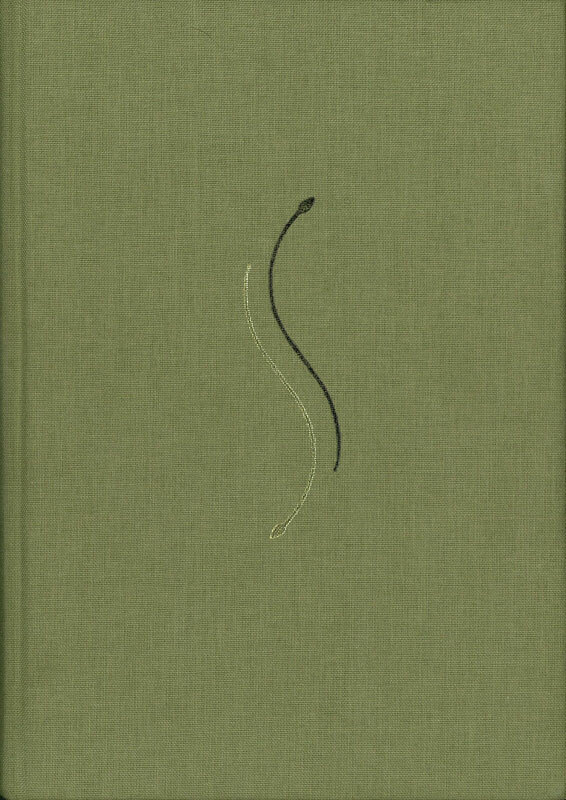 Serpent Songs comes in two editions: a Sylvan edition of 750 exemplars, bound in olive cloth, and a Serpentine edition of 64, hand-bound in verdant goatskin. Title, publisher and a dual snake motif are rendered on the spine and cover in gold, but as with most Scarlet Imprint books in my possession, this has started to flake and fade, being perhaps not entirely enamoured with the cloth binding into which it has been imprinted. End papers are black with a serpentine wave pattern rendered in copper or a muted gold, while the internal pages are a creamy, and gloriously heavy, stock; so heavy in fact that you find yourself checking the page numbers each time you turn the page as it feels like you’ve grabbed two. The type is set with initials in Paris Verand and the body fully justified in a small Satyr face that might be too tiny for some readers but which is just right for me. This is all formatted with the generous margins that give that trademark Scarlet Imprint refined and archaic look. Splendid. This beautifully presented and compact little book brings together, as the title suggests, thirteen rites for the Old One. 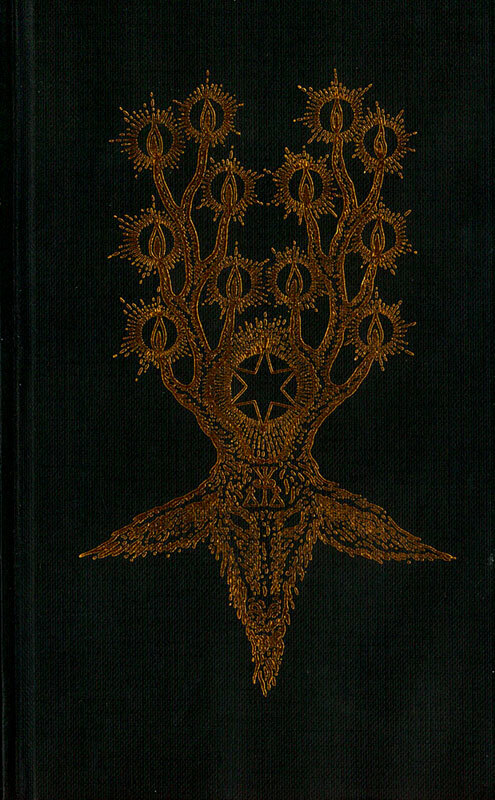 And, as also indicated by this title, the cover image and the abundance of horns throughout the book, this Old One is most unashamedly the Devil of folklore, viewed through the lens of Traditional Witchcraft. Distinct from the church’s concept of Satan, this Devil still presides over evil, but these are the perceived evils of personal freedom, indulgence and ecstasy. He is, as Gemma Gary explains in her introduction, the bearer of forbidden gifts, the opener of the Way Betwixt, and the old spirit of the land. Gary is at pains to point out that these rituals make no claim to any great antiquity or hereditary descent, but rather draw on extant themes that are well documented in the folk record. There is, naturally, a focus on matters Cornish, with several dealing with the Bucca, and these rites act as a concise adjunct to much of the material found in Gary’s more explicative Traditional Witchcraft: A Cornish Book of Ways. This book is not without its own explications, though, and each ritual is preceded by a brief explanation providing its context and attendant folklore. Gary defines these thirteen as rites of vision, dedication, initiation, consecration, empowerment, protection, illumination, union, transformation, devotion and sacred compact. It is a sacred compact to the Devil as the Man in Black or Dark Man that acts as the first rite in this collection, establishing a relationship and setting the scene for that which is to come later. This is a simple procedure, effectively an elaborated statement of intent that is preceded by a little ritual structure (thrice utterance of the Lord’s Prayer backwards in a remote location), and followed by a period of reflection during which the Man in Black may manifest in some manner. This compact is indicative of Gary’s ritual style: fairly succinct with some nicely written liturgy. There’s not much in the way of obscure ingredients, elaborate correspondences, complicated formula or extended periods of time, with the rites having more of a feel of hedgewitch pragmatism. The only temporal imperatives are fairly standard things like midnight and during a full moon, while the ingredients and tools list tends to speak to things that anyone embracing the aesthetics of Traditional Witchcraft will end up acquiring (if only too look cool in their altar photos on Facebook): iron nails, an iron knife, a scourge, horned skulls, dragon’s blood incense and a stang. Circles abound in these rituals, as does the use of mill treading as a way to generate power and there is a general feeling of getting out amongst it, with hands dirty from soil and the soot of flaming torches. It is the written word in which Gary excels, with her incantations having an archaic quality that doesn’t wrap itself up in arcane complexity (or misapplication), and instead flows with a degree of authenticity. This is aided by the occasional use of rhymed couplets and alternate rhymes, which gives some of the words a folky familiarity, as if they’ve been overheard in playgrounds for centuries; obviously those would be rather spooky playgrounds. At 187 x 114mm, The Devil’s Dozen is a small volume that has a diary-like quality to it, fitting comfortably in a single hand or handbag for easy transportation to ritual locales. Its slight width does lead to rather snug gutters that do require the book to be splayed wide in order to catch everything and having the, one supposes unintentional, side effect of a sense of bibliographic intimacy as one spreads and peers in. As with most if not all of Gary’s books, The Devil’s Dozen is illustrated by the author herself in her trademark stippled style of pen and ink. 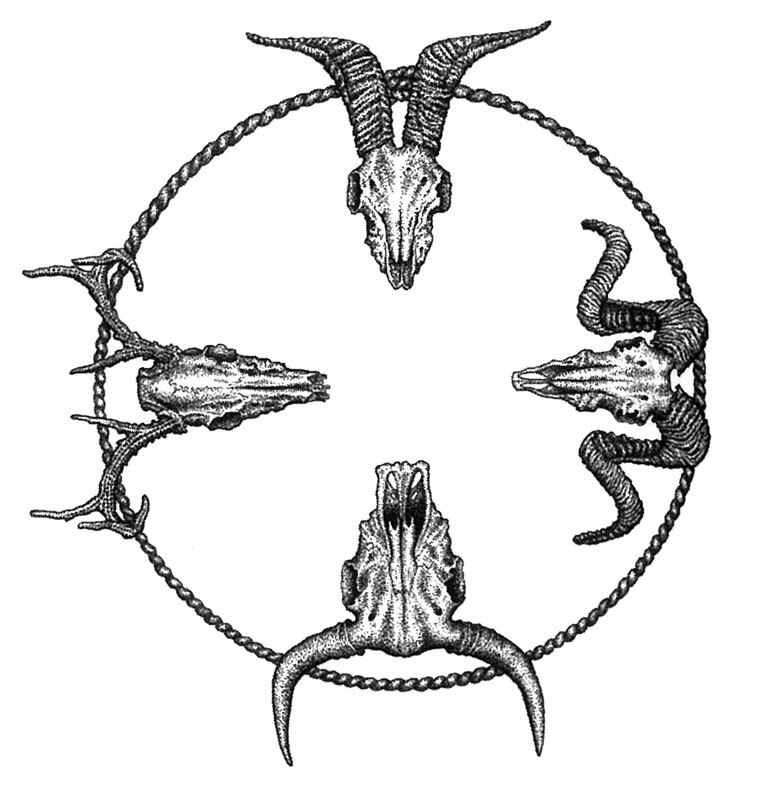 These are usually found as full-page preludes to the various rites, while a veritable study of horned skulls is dotted throughout the work as fillers. 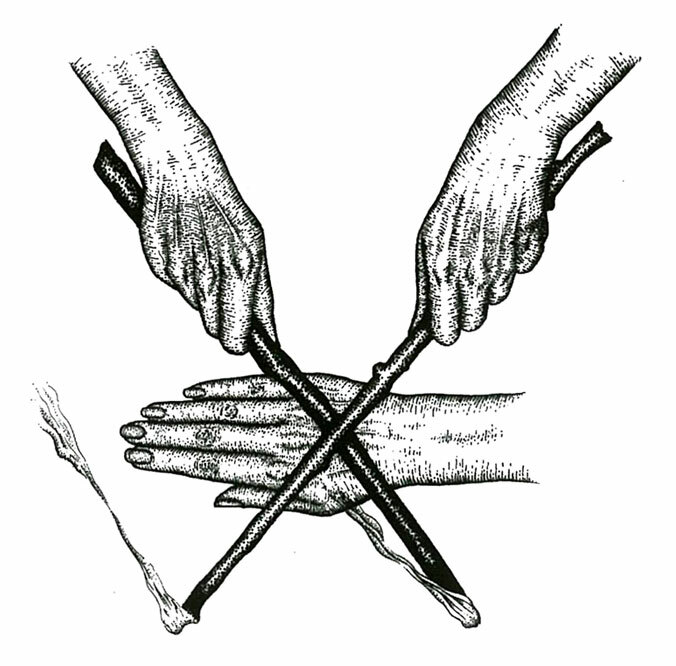 In addition to these in-body illustrations, there is a selection of black and white plates by Jane Cox, providing a photographic record of some of the procedures contained herein, along with various apposite images of witchcraft-related accoutrements. The Devil’s Dozen is published in four editions, each consisting of 160 pages, along with eight black and white photo plates. In addition to a regular paperback version, there is a hardback incarnation which attains a pretty nice level of quality for what is the affordable standard edition with its 80gsm cream paper stock, black case binding, copper foil blocking on the front image and the spine, hunter green endpapers, and green and black head and tail bands. There are two special editions, the 300 hand-numbered Special Edition bound in dark, grained green recycled leather fibres, with the cover and spine elements in blocked in gold foil, green end papers and green and black head and tail bands. 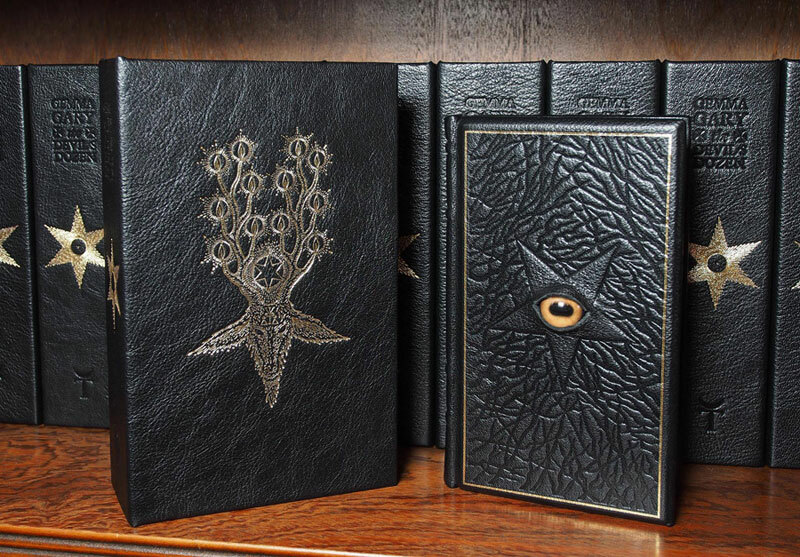 The even more luxurious Special Fine Edition is suitably limited to 13 sold out hand-numbered copies in full black goat leather binding with a gold border and a blind embossed thicket of branches on the bevelled front board, inset with a high quality glass goat’s eye cabochon. This is further housed in a full goat leather solander box, blocked in gold and lined. There is no shortage of books about Traditional Witchcraft upon the shelves in the Scriptus Recensera library, filled as it is with worthy contributions from Michael Howard, Gemma Gary, Shani Oates, Andrew Chumbley, Nigel Jackson and others. And that’s not to mention the works of the pretenders and imitators that haven’t been granted access to these hallowed halls. The question that arises, then, is whether Nicholaj de Mattos Frisvold is able to bring anything new to the table. Frisvold certainly seems to think so, cutting my musings off at the pass and making his case early on for one major point of difference: a focus not just on the British and Scandinavian sources for witches, but on the parallels that are to be found in Italy and even further afield in South American expressions of magic, especially those connected with African diasporic religions. 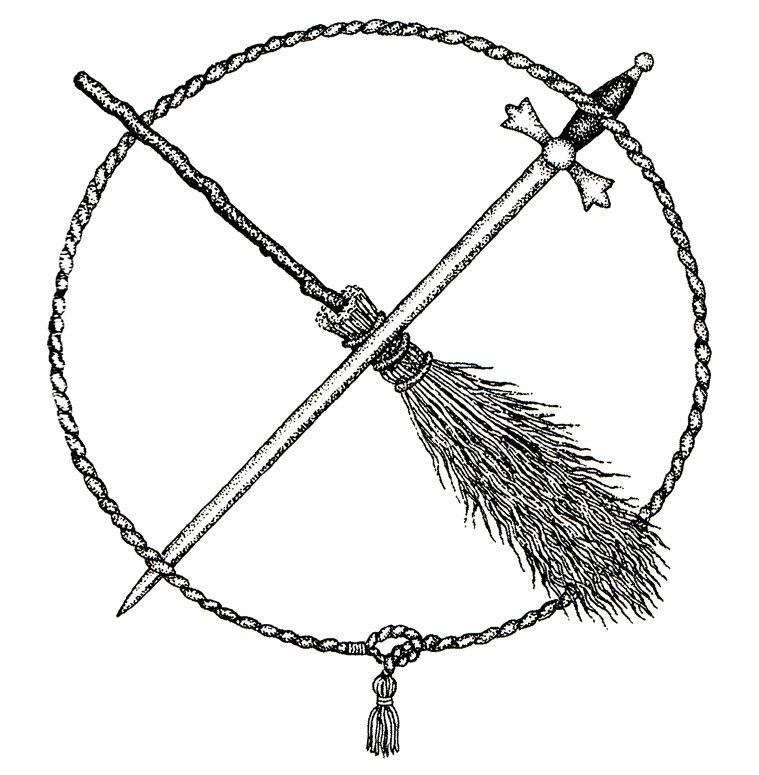 Thus, a consideration of the crossroad in witchcraft inevitably makes a brief detour into the comparable symbolism in Yoruba belief and Vodou, facilitating a full circle of motifs when ‘the kingdom’ from the Cult of Exu finds an analogue in the Witches’ Sabbath. Frisvold makes another distinction at the outset, noting that similar books are often highly eclectic in their approach, uncritically embracing myths and legends, with an attendant use of etymology and epistemology. However, there is often little to differentiate what is presented in this book with the style of, say, Michael Howard, Nigel Jackson and Shani Oates, three authors who, to my mind, have often written with an encyclopaedic, info-dump approach that embraces folklore, legend, myth and etymology in a rather broad manner. Frisvold’s sources are a little different from those of Howard, Jackson and Oates, though there are certainly some common ones; and titles from Cappall Bann do make a significant contribution to the bibliography. Instead, Frisvold draws heavily on material from Hermeticism and the Western Tradition, with an obvious and fairly frequently fondled touchstone being found in Cornelius Agrippa. There is a utilitarian approach to the writing here with a conversational tone that precludes much in the way of scene setting or background exposition when information is presented. Frisvold obviously knows his stuff (except perhaps for the bit about Robert Johnson dying at the crossroads, wahhh? ), so there’s no feeling of him skimping on the details out of ignorance, and while you don’t need to over explain things to an occult audience (where a certain familiarity with the material is expected), it still feels like more context could be provided before the nuggets of knowledge are dropped. The brevity of Frisvold’s writing is also evident in a lack of transitional phrases tying paragraphs together, with ideas often being abruptly introduced as if they have no immediate relation, to the subjects that have gone before. This leads to a jarring effect when blocks of information appear, if only briefly, as if they are non sequiturs, barren of any relation to the wider discussion. Each chapter in Craft of the Untamed is prefaced with a black and white illustration by Audrey Melo, who also provides the painting that features on the cover. The reproduction of these internal illustration varies widely in quality, with everything from acceptable to quite pixelated, to goodness me, they’ve put pixels in their pixels so they can pixel when they pixel. These images are also wildly inconsistent in style, with Melo having no discernible look of her own and instead riffing on the aesthetics of various familiar esoteric artists. 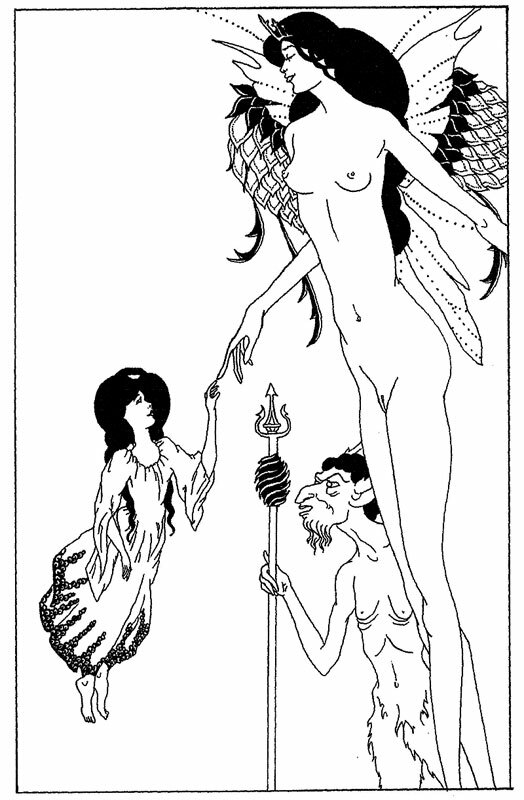 There’s a few atavistic Austin Osman Spare motifs, a fairly convincing Aubrey Beardsley pastiche, and a couple of images that are an obvious tribute to the unknown artists of a thousand wishful metal album covers scrawled across a thousand school exercise books. One image takes Brian Froud as its inspiration and by inspiration I mean that at its centre is one of his rather distinctive characters, economically traced, without credit. Craft of the Untamed is better formatted than many Mandrake of Oxford titles, with none of the cramped styling that is usually found amongst their books. In place of it, though, and proving I’m never satisfied, is an overly generous leading that almost approaches double line spacing in depth and which, although allowing things to breathe, does result in just 30 lines of text on a page. This count is reduced even more when the style is applied to what ends up being rather spaced out invokations that can’t help but be read in a stilted, broken tone worthy of William Shatner. There’s an unfortunately typical lack of attention to detail in the formatting and proofing: chapter headings can’t decide if they’re meant to be bolded or not, the first page of each chapter flaunts convention and includes the header with the book’s author and title in it (as do all other pages, regardless of the content), and there’s a reckless disregard for punctuation, with a surfeit of missing, redundant or misplaced commas. With its overgenerous leading, Craft of the Untamed makes for what feels like a slimmer volume than its tally of 180 pages would suggest. When this is twinned with Frisvold’s brisk style of writing, the reader can find themselves skipping quickly through the pages. As an overview of some of witchcraft’s themes, Craft of the Untamed meets its brief, and the point of difference, largely unpromised at the start, is a tendency to relate these to Western Occultism and Hermeticism, with Frisvold’s affiliation as a Traditionalist occasionally coming through via this approach. Subtitled Mythos, Ethos, Female & Priestly Mysteries of the Clan of Tubal Cain, this is a collection of articles by Shani Oates, current Maid of the Clan of Tubal Cain. Anthologies can often be a less than satisfying reading experience, with the piecemeal nature of the presentation never engendering the focus that a singular work can provide. This is certainly the case here and there was just something a little disappointing about discovering that what I thought was a going to be a focussed book on the mysteries of the Clan of Tubal Cain is, by its very nature, broader and not nearly as specific as its retrospectively applied title promises. In saying that, the essays have been grouped into sections, so there is a semblance of order, with divisions devoted, as the subtitle denotes, to female mysteries, male mysteries, priestly mysteries, and Clan ethos. The essays that form this collection are taken from various pagan magazines, principally Hedgewytch and Michael Howard’s The Cauldron, but also White Dragon, Pendragon and the New Wiccan. The subject matter falls into the broad remit of the Clan of Tubal Cain, having the same polymathic qualities possessed by Robert Cochrane, drawing on folklore, mythology and general witchlore to create a vision of a coherent and very particular form of witchcraft. Oates writes in a style not too dissimilar to that of her mentor, Evan John Jones, and fellow travellers Nigel Jackson and Michael Howard, in that it is anthropologically broad and encyclopaedic but not overly critical, casting wide thematic nets that are not always necessarily tethered with specific citations. This net sometimes embraces the works of so-called alternative history, a field that could be said to have something of the magical in itself, since its logical leaps and less than rigorous familiarity with the facts is suggestive of metaphysical paradigm building, where peer-review is less important than an internally consistent worldview. Thus, in Mythopoesis, Laurence Gardner’s Genesis of the Grail Kings is referenced, extensively and uncritically, in a discussion of Mesopotamian cosmology, where perhaps recall to more reliable, or even primary, sources would have been advisable; and would have inspired more confidence. Mythopoesis introduces the opening section of writings on the mythos of the Clan of Tubal Cain, and, despite my misgivings about Gardner as a source, it is an interesting, well written overview of matters witchcraft and Qayinian, beginning in the broad, speculative world of alternative history before ending with a discussion of ritual tools and praxis. This is followed by a welcome discussion about Goda, the pale goddess of fate in the cosmology of the Clan of Tubal Cain, in which Oates brings together various linguistic traces of the name, as well as summarising Cochrane’s thoughts on the goddess, collected from his various correspondences. The third chapter in this section, is missing, suggesting some great esoteric mystery… or mayhaps just a clerical error. The book’s abruptly promoted fourth chapter is a dissertation on Hekate and opens the section on female mysteries. Each of these pieces is a broad consideration, and its seems to very much be Oates’ modus operandi to take a core subject as an opportunity to explores related tangents, often bringing them ultimately to bare within a witchcraft frame of reference. Thus the female mysteries are explored from the root themes of courtly love, Salome’s seven veils, the hand of Fatima, Sheela na gigs, and the Day of the Dead (which marks a stylistic diversion from most of the other essays with its more travelogue structure and voice). Under the rubric of male mysteries Oates is able to consider the Wild Hunt (covered in two essays), the Green Knight (of Sir Gawain fame), and solstice traditions, all presenting a fairly consistent theme of the king of the greenwood. There’s a certain continuity of these themes into the section on priestly mysteries, with arboreal kings figuring in the essay The Divine Duellists, but otherwise the topics at hand are new, with considerations of the Fisher King, the symbolism of cranes, and the mythic analogies of entheogens (which provides summaries of all the usual suspects: Wasson, McKenna, Allegro). Finally, the section on Clan Ethos could be said to follow the lead of its first essay’s title, Musings on the Sacred, with these contributions being considerably less encyclopaedic than their predecessors, with more of a discursive quality. The most interesting of these are ones that deal more specifically with Robert Cochrane and the Clan of Tubal Cain, fulfilling the original promise of the book’s title. The Mystery Tradition considers the difference between paganism and witchcraft, reflecting on Cochrane’s differentiation betwixt the two, while A Man for all Seasons considers magickal inheritance and Cochrane’s ideas of the witchblood. The remaining essays explore various clan-related ritual procedures, including initiation and the division of ritual forms into three rings of divination, spell-casting and communion. For a Mandrake publication, Tubelo’s Green Fire doesn’t do too badly in the old formatting stakes, with an overall consistent and perfunctory layout that doesn’t overly interfere with reading. That said, the point size of the body is a smidgen too large, and the margins on all four edges are too tight; as is, naturally, the gutter. This leads to a slightly claustrophobic feeling whilst reading, with even the endnote references rendered in the uniform size of the main body, and the titles in nothing more than a functional larger version of the same typeface. A lack of attention to detail means that each essay retains its original referencing style, and these come in all shapes and sizes, appearing as in-text citations in some cases, and as end notes in others (with even the formatting of these differing between usages). There’s also a few idiosyncratic, but inconsistently applied, punctuation quirks, such as randomly presenting some names, and in some cases, words, within single quote marks; a peculiarity that is then inexplicably compounded still further by occasionally presenting some of these quoted words in italics with no rhyme or reason. The pages of monolithic typographic colour within the book are occasionally (and I mean very occasionally) interspersed with simply rendered illustrations by Liza Miskievicz. The cover bears an image, The Fortunate Isle, by the always wonderful Nigel A. Jackson, made significantly less interesting by being unimaginatively inverted; and the less said about the accompanying title in an unnecessarily distressed typeface, coloured zombie-movie-green, the better. First, a eulogy: recently departed Michael Howard (1948–2015) was quite possibly my gateway drug to occultism. His Wisdom of the Runes was the first book I read on runic magic and his magazine, The Cauldron, provided my first tantalising insights into Robert Cochrane’s Clan of Tubal Cain (way back in the pre-internet days when there was a lot less info about and precious little mentions of him and the Clan in books). 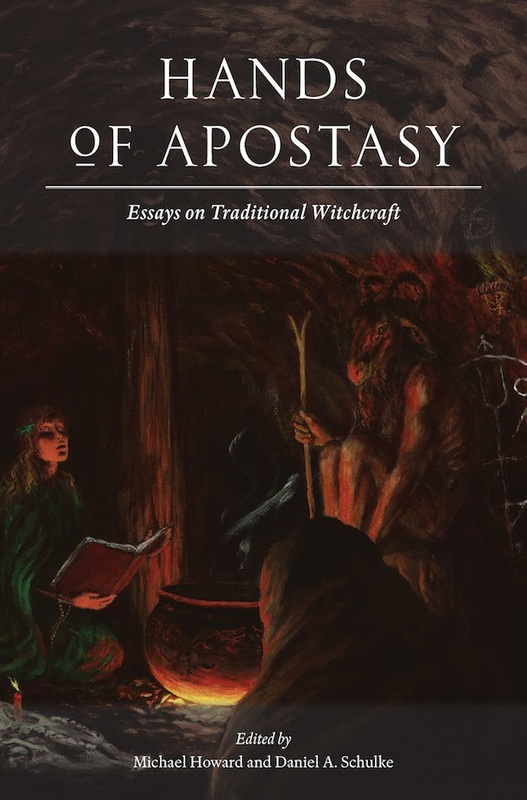 A survey of Scriptus Recensera entries show that a significant amount of his work has been reviewed here: The Book of Fallen Angels, an issue of The Cauldron, his important tome Children of Cain, and most recently, Hands of Apostasy, which he co-edited with Daniel Schulke. This, needless to say, was not by design but a mark of how prolific he was and how well his oeuvre matched my interests. I always found Michael so thoroughly genuine, something frustratingly rare in these circles where smoke and mirrors dominate and where people spend so much time shoring up their claims to some amazing lineage, or trying desperately to appear privy to some amazing knowledge or in possession of equally amazing skills and power. He had such an obvious passion for the magickal milieu within which he lived. As I remarked in my review of Children of Cain, Michael’s approach to things magickal could be said to have a Mulder-like willingness to believe that was tempered with a Scullyesque critical approach that cautioned him against totally subscribing to anyone’s claim; at least in print. He always seemed willing to entertain someone’s claims, not in a blindly, uncritical manner, but rather in an “it’d be nice if it’s true” kind of way. Witness his patronage of Bill Liddell and the claim that Essex cunning man George Pickingill was actually a grand master of nine covens who had direct influence on everyone from Gerald Gardner to the Golden Dawn. As I noted in my review, it is an appealing theory, and one can’t help feeling that Michael gave it as much space over the years as he did (in both The Cauldron first and later in Children of Cain) because of just how glorious its grand vision is. By no means did he ever state, to my knowledge, his acceptance of Liddell’s claims, but there’s a feeling that he wished they were true. And why not? Until Xoanon and Three Hands Press publish any of the unpublished texts they have in their archives, Liber Nox is the last major writing from Michael Howard and, in many ways, stands as a fitting testament to him. It consolidates much of what Howard has considered over the years in matters of traditional witchcraft, providing it in a format that prefaces everything with a lot of broad anthropological examples and explanations, and then concludes with a breakdown of the wheel of the year and a series of corresponding rituals. As such, it contains more factual information than your average grimoire, or your bog-standard rituals-and-recipes book for that matter, and is all the more satisfying for it. In the first section, Preparing for the Rites, Howard explains the symbolism of various ritual tools, elements and procedures. Rather than the usual cursory explanation one would expect in other books, this digression is a significant one that facilitates a wider exploration of the themes of witchcraft. As was sometimes the case in his writing, Howard’s approach here can sometimes be a little info-dumpish, with a wealth of information being presented but relatively little discursive dialogue to provide pacing or highlight, admittedly self-evident, connections or motifs. There is also no referencing, except for the very occasional in-text citing of sources for specific quotes, so while you never doubt the accuracy of Howard’s facts, there is the occasional niggling feeling of needing to fire up the old Google machine to see what his source might have been for a particular nugget of gnosis. A similar approach follows in the second section, The Wheel of the Year, where said wheel and its associated festivals provide an opportunity to consider in depth various folklore and witchcraft themes. A discussion of Candlemass, for example, is able to embrace the goddess Brigid and her saintly incarnation as St. Bridget, as well as the Cailleach, goddesses of Sovereignty, and loathly ladies. Similarly, a discussion of May Day gives insight not just into figures such as the May Queen but unicorn symbolism, the underworld journey to the Castle of Roses and Sir Gawain’s encounter with the Green Knight. Often the matters discussed for each festival seem almost tangential to the extent that you lose track of where it all began and which celebration is up for discussion. This is, by no means a bad approach, and in fact I’m rather partial to it. It means that rather than the kind of brief cursory description of a festival you can find in any book on witchcraft, Howard’s style paints a wider, more holistic picture, which places these events within a greater magickal world of interrelating symbolism and themes. Thus, this second section of folklore and festivals, which is easily half of the book, provides what is effectively a thorough consideration of traditional witchcraft, shot through this anthropological lens. It is only in the book’s third section, the Liber Nox proper (gloriously subtitled The Rites of the Black Book of Shades), that the reader encounters the kind of ritual material one would perhaps expect of the gramarye promised in the subtitle. Howard prefaces his rituals with a consideration of the year which consolidates the mass of material from the previous section into a narrative of changing seasons, rising and falling deities, and elements waxing and waning. He makes it clear that the rituals presented here are not from any particular tradition but have been written entirely for this book, incorporating aspects from various traditional witchcraft sources and obviously the folklore of the wheel of the year. There are certainly elements you can spot, with the imagery of the Clan of Tubal Cain, for example, coming through clearly in the use of dancing mills and castles. The first of the rituals is an all-purpose casting of the circle of arte, followed by instructions for a concluding houzel and a closing of the circle. Then follows rites for all the previously considered stations of the year: Yule, Twelfth Night, Candlemas, Lady Day, May Day, Midsummer Day, Lammas, Michaelmas and Hallow. Perhaps not surprisingly, there’s a pleasant, expert style to these rituals, indicative of the experience and expertise that Howard had. The liturgy is beautiful but simple and refined with no ornate archaisms and nothing you’d feel too silly saying out loud; a constant ritual concern of mine. There is also a variety of activities, and despite the use of very specific structure, there’s less of the usual rote feeling of intone *variable,* do *variable,* banish, and goodnight everybody! Many of the rites feature variations of circular dancing, often incorporating intertwining ribbons, while in the ritual for Midsummer Day, two additional stang are used to form a gateway to the realm of Fey through which celebrants visualise themselves passing. With its carefully considered structure of anthropology followed by, erm, ritualology, Liber Nox, makes for a satisfying read. It incorporates so much of what Howard considered in his life as a writer, but distils it in a finely crafted manner, refined and shorn of the distracting spelling errors and generic formatting that marred his similar material in books published by the reckless Capall Bann. There’s no sense of re-treading areas already well-travelled, even though the referencing of folklore was something he often did. Instead, like the rituals written specifically for this volume, there’s a feeling of Howard setting out to write something self-contained and true to itself. Liber Nox is available as a paperback of 218 perfect bound pages, printed by Lightning Source. The formatting has a confident, effortless style, with the body set in Adobe Caslon at a nice point size with sensible leading; albeit fully justified. Titles (along with the chapter-leading drop caps) are set in the rather lovely Newcomen face, while the subtitles are rendered in the scratchy scripty 1491 Cancelleresca. 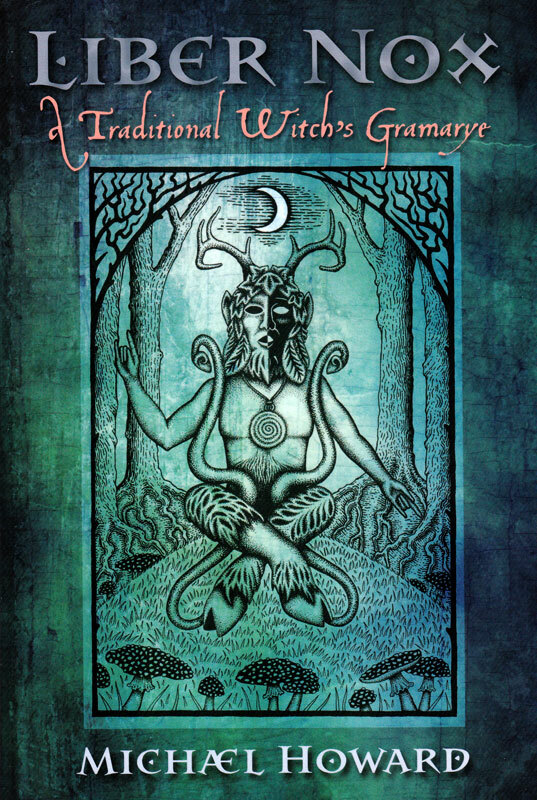 Liber Nox is illustrated throughout by the black and white illustrations of Gemma Gary, who also provides the stunning image of the horned god on the cover. 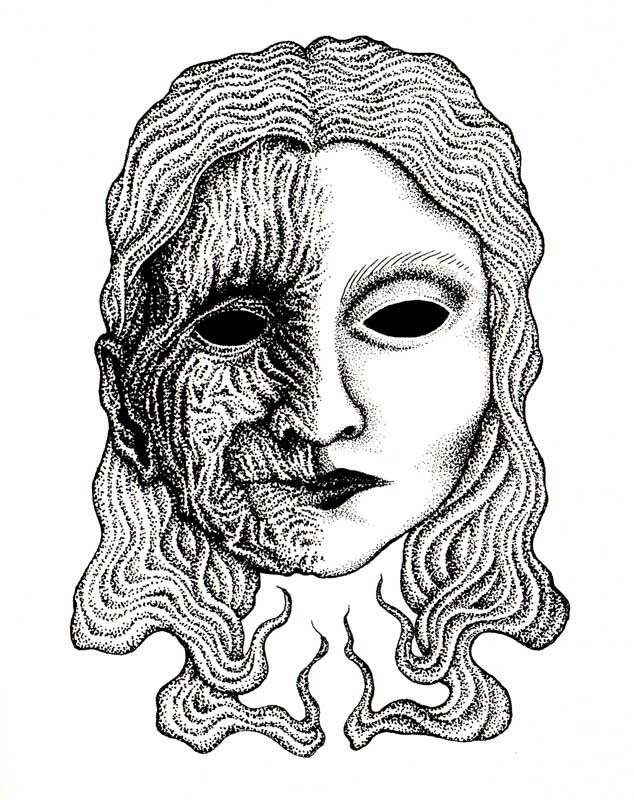 Her illustrations are often of familiar folkloric images, masks and masques, rendered anew in her stippled style. In my mind, I always find this book from Three Hands Press occupying the same mental space as Serpent Songs from Scarlet Imprint. Both are compendiums of essays on various witchcraft topics, with a focus on what is referred to as traditional witchcraft. And both take themselves pretty seriously. With eighteen authors contributing to this collection, there’s a wealth of viewpoints and writing styles, with both sides of the Atlantic getting some coverage, and styles both academic and anecdotal being featured. By accident or design, North America gets the early focus with Douglas McIlwain talking briefly about his stateside family tradition, while Cory Thomas Hutcheson’s Killing the Moon is a thorough investigation of witchcraft lore from the mid-to-southern Appalachians. The lunacide of the title (and its solar analogue) is an initiatory ritual element found throughout the south, ranging from the Appalachians to the Ozarks. A focus on folk practices is found elsewhere in this volume, with David Rankine considering the influence of witchcraft and natural magic on the grimoire tradition (a reversal of the common narrative of low witchcraft borrowing from high magic), while Gary St. Michael Nottingham covers similar territory with a survey of conjure-charms from the Welsh Marches. As with Rankine’s essay, Nottingham shows an interaction between the grimoire tradition and folk magic, documenting the source texts from which various charms would have been sourced. There are several essays that take a more conceptual, rather than practical or documentary, approach, using themes from traditional witchcraft as lenses through which a greater philosophical picture can be explored. Most notable of these is the longest essay here at 45 pages, Martin Duffy’s The Cauldron of Pure Descent, which considers that magical accoutrement most firmly associated with witches, the cauldron. Given the length of his essay, Duffy is able to, if you’ll pardon the obvious, throw many things into the pot, creating a thorough exploration that embraces not just witchcraft but Palo Mayombe, alchemy, and various strands of mythology. In The Man in Black, Gemma Gary considers the devil in witchcraft, although less as the horned master of Sabbaths and more as the enigmatic stranger encountered by witches in times of need and moments of isolation and reflection. Michael Howard’s Waking the Dead almost rivals Duffy’s length with its investigation of necromancy which begins somewhat encyclopaedically, rather than discursively, before finding its feet towards the end when Howard assimilates the assiduously assembled information into a sabbatic craft context. Andrew Chumbley does rather well contribution-wise for someone who passed on in 2004, providing two pieces, The Magic of History: Some Considerations and Origins and Rationales of Modern Witch Cults. As their titles suggest, both are broad in their concerns, rather than specific, briefly surveying the history of modern witchcraft and the intersection with Chumbley’s own sabbatic craft brand of traditional witchcraft. 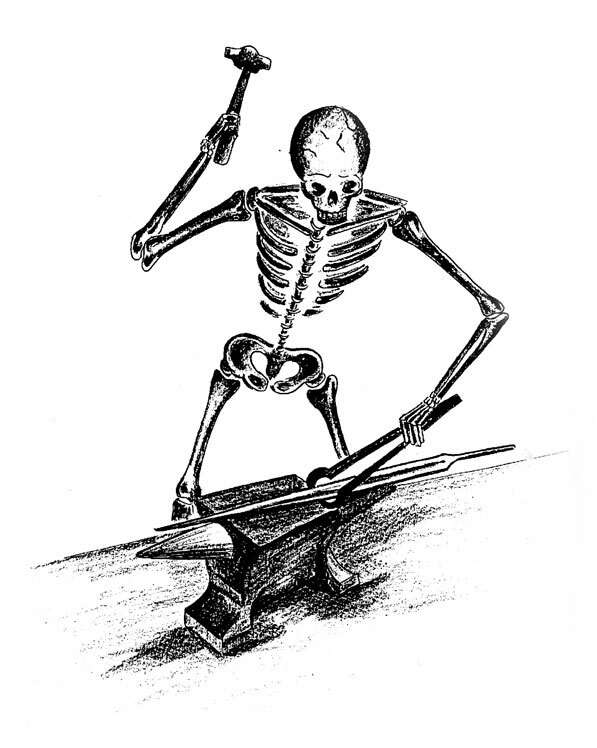 Also participating from beyond this mortal veil is Cecil Williamson, founder of the Museum of Witchcraft, whose rather short article looks at two little known magical techniques, moon-raking and the ritual of the shroud. This slight essay previously appeared in The Cauldron, and is prefaced with a preamble by that magazine’s editor, Michael Howard, which is only one page shorter than Williamson’s actual words. 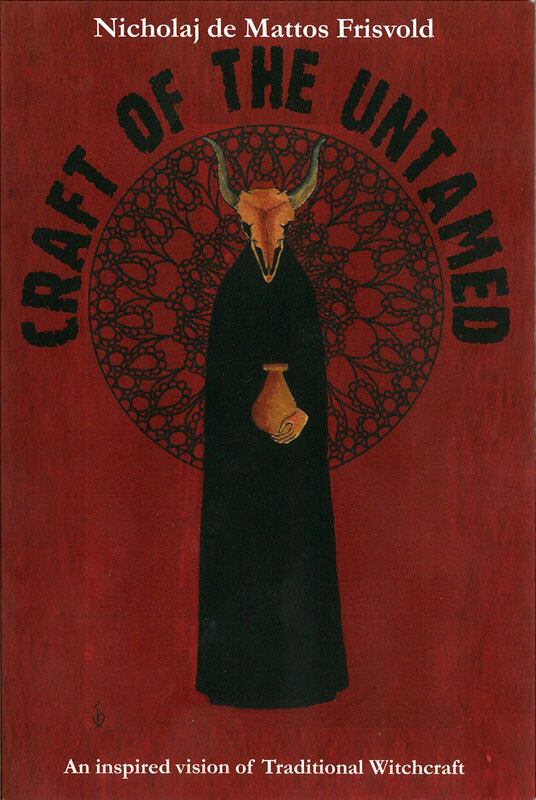 As one would expect, the sabbatic craft makes a significant contribution to this volume, with Chumbley’s two pieces being joined by The Blasphemy of Things Unseen by Daniel Schulke. Schulke writes in his usual florid style, embellishing his words with archaic flourishes in a meditation on the role of night, darkness, secrecy and the void in witchcraft and specifically the sabbatic cultus. But the most interesting exploration of Chumbley’s oeuvre comes from Jimmy Elwing with Where the Three Roads Meet. Subtitled Sabbatic Witchcraft and Oneiric Praxis in the Writings of Andrew Chumbley, this is an admirably sanguine and removed biography of Chumbley, providing a meticulous analysis of the themes in his writing; and one of the highlights of this compendium. 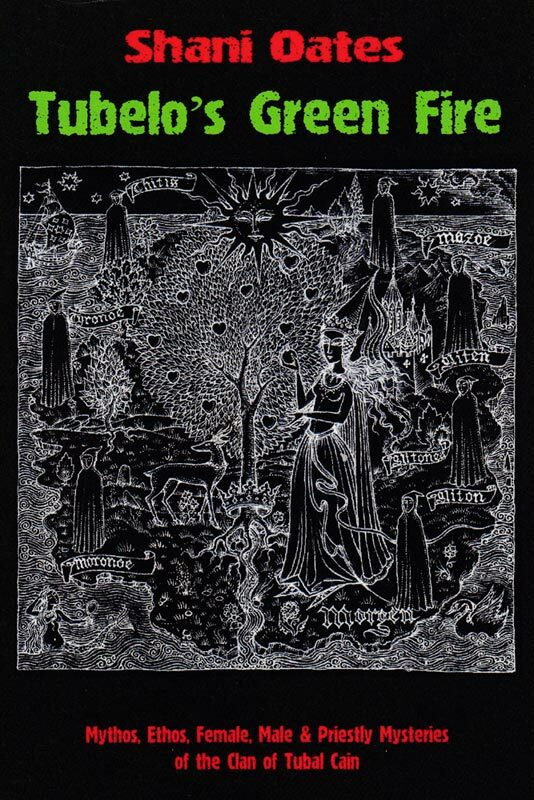 Elsewhere, Radomir Ristic’s Unchain the Devil considers Serbian witchcraft and seems to act as a teaser for their full book Witchcraft and Sorcery of the Balkans now available from Three Hands Press. Levannah Morgan’s Mirror, Moon and Tides is the only purely experiential piece here, clearly and authoritatively explaining their personally grounded techniques of mirror magic with little need to recourse to the authority of either tradition or the academy. There is a certain rigour to most of the material here, whether it’s deference to academia with a thorough embracing of citing and referencing, or less thoroughly, an explicit identification of experiential knowledge or tradition. The same cannot be said for the rather anomalous contribution from Raven Grimassi, who plays to type and writes with the broad and speculative strokes one would expect of a Llewellyn author. 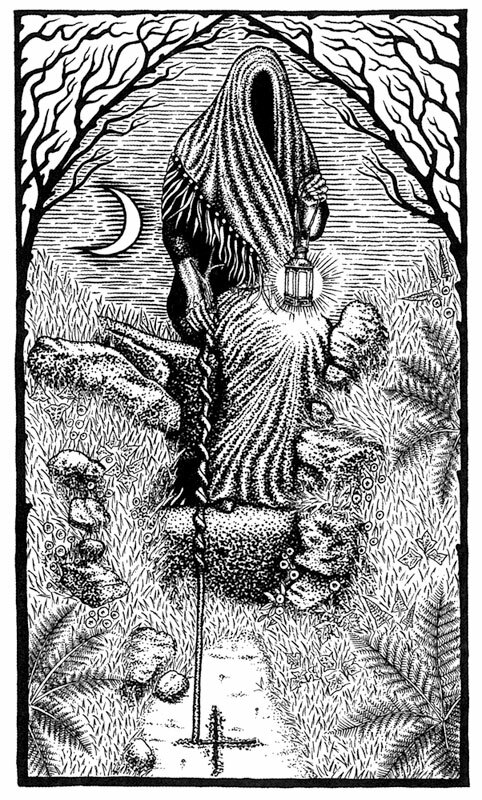 His piece, Pharmakeute, is typical of Llewellyn woolly thinking, full of unreferenced references to unspecified ancient times and unspecified ancient ancestors; a precedent set in the first sentence which boldly and broadly states “ancient writings depict the witch as living among the herb-clad hills” – which writings, which witch, which herb-clad hills? In an amateur attempt at anthropological psychology, Grimassi speculates that a magical worldview may have been influenced by the ancestral experiences of living in forests – these ancestors and their wooded location remain unidentified, adrift in some imagined olden days, distant from all the other unspecified ancients who can’t have had a magical worldview because they lived on hills, plains, mountains, in caves, by river and lakeside and, I don’t know, maybe anywhere that wasn’t a potentially lethal forest. While discussing mandrakes, Grimassi wonders if the idea that mandrake had to be harvested using a dog pulling on the plant (lest the harvester be killed in the process) was created by witches in order to discourage laypeople from effectively raiding their stash. Yeah, cool story bro, except that the technique has a significant pedigree dating back to at least the first century CE where the Romano-Jewish historian Josephus made the first written mention of a presumably well extant belief. I guess some ancient witch from the olden days must have been playing a long game and dropped the skinny to Titus Flavius so he could spread the word on their behalf. With its diverse collection of writers and subject matter, there’s something in Hands of Apostasy for everyone; well, everyone interested in traditional witchcraft that is – if you’re after something on fly fishing this may be less useful. The highlights are definitely Martin Duffy’s exhaustive consideration of the cauldron and Jimmy Elwing’s analysis of Andrew Chumbley. The low lights go without saying. Hands of Apostasy comes in standard hardcover edition of 1000 copies, in full pewter book cloth, with a glossy fully colour dust jacket. The internal pages are made of a stark, not entirely attractive white stock and the text is formatted in a capable, functional style. Almost all of the nineteen articles are prefaced with illustrations by Finnish engraver Timo Ketola, whose finely rendered volumetric style provides the book with a cohesive, slightly timeless style that is, given his background, just a tiny bit evocative of metal aesthetics. A limited special edition of 63 copies in quarter goat with corners, hand marbled endpaper, and slipcase, is now, of course, sold out.